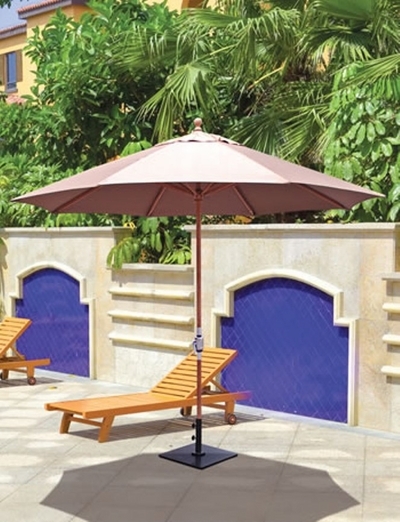 Spacious shade and style are yours with the luxurious Galtech 11' ft. teak wood patio umbrella. High quality teak is used for the pole and hubs to add both attractiveness and durability. The wood has a deep, rich finish that adds upscale appeal to your open-air space. Open the sizable canopy with the convenient crank lift system and keep it open by using the locking button on the housing. With its wide variety of premium Sunbrella and Suncrylic fade-resistant fabrics this outdoor umbrella is sure to retain its beauty from season to season. The Galtech 11' Teak Wood Patio Umbrella is a popular choice for your outdoor space. * Shade Size: 11.0' ft.